A hardy biennial growing about 600cm tall and bearing umbels of delicate white flowers from June to August. All parts of the plant are edible but it is the liquorice flavoured seeds that are used in herbal remedies. Used in relief of indigestion, stomach aches, trapped wind and to soothe bloating. 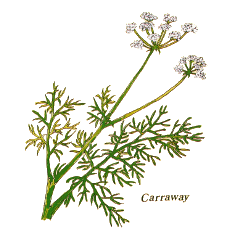 Caraway seeds have been found in prehistoric food remains from 3500BC and the Greeks used it to aid digestion. It has been found in Egyption tombs. 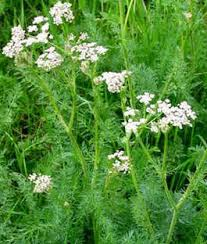 In olden days caraway was thought to confer the gift of retention preventing any object containing it from being stolen. It was used as an elizabethan love potion to prevent lovers from straying as well as being fed to fowl and pigens to ensure they returned home.